Please note we have limited numbers of stock of the Sealed Frame available in this style. Please purchase quickly to avoid disappointment. A panoramic design gives this model the widest field of vision and a transparent frame allows the maximum amount of light to reach your eyes. Each pair has special overflow chutes to channel away liquid or steam and an adjustable strap linked to ball pivots for a perfect fit. The lens is rated at Optical Quality 2 which is designed for intermittent use. 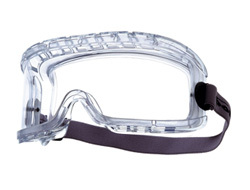 If you require a goggle for regular and long periods of use then please see the Blast or Pilot which both use Optical Quality 1 lenses for permanent use. 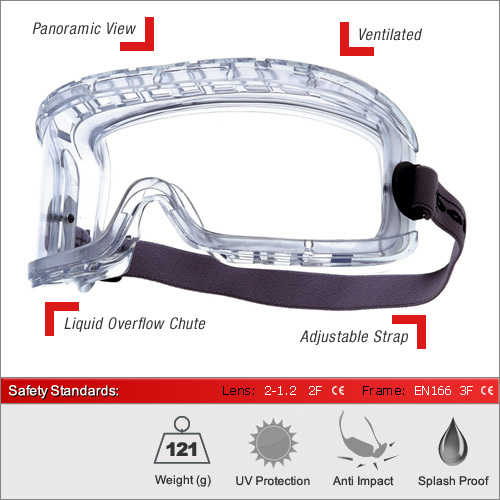 They are rated to resist category F impacts which is the same as most safety glasses. For a higher impact resistance see the Blast or Pilot which both use B / T rated lenses.